Fig. 2. 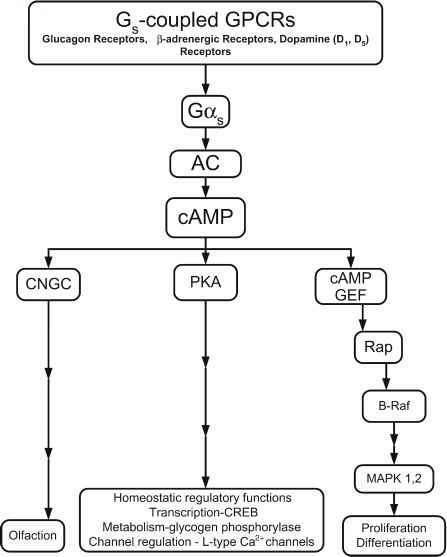 (From opposite page) domain (P), and the amino (R1) and carboxy (R2) terminal regulatory domains. The locations of binding sites for Src SH1 and SH3 domains, Ask1, JNK3, inositol 6-phosphate (IP6), clathrin and AP2, as well as the major regulatory phosphorylation sites of P-arrestin 1 and P-arrestin 2 are also indicated. Other putative arrestin binding proteins whose interacting domains have not been mapped are listed. not required for this process; thus, receptors that have not bound ligand, including receptors for other ligands, can be desensitized by the activation of second-messenger-dependent protein kinases. This lack of requirement for receptor occupancy has led to the use of the term heterologous desensiti-zation to describe the process (36). In some cases, such as the P2-ARs (37,38) and murine prostacyclin receptors (39), PKA phosphorylation also alters the G protein-coupling specificity of the receptor to favor coupling to the adenylyl cyclase inhibitory G protein Gi over the stimulatory G protein Gs, causing the PKA-phosphorylated receptor to "reverse direction" regarding cAMP production (40). Fig. 3. Role of P-arrestins in the desensitization, sequestration, and intracellular trafficking of GPCRs.Homologous desensitization of GPCRs results from the binding of P-arrestins (P-arr) to agonist (H)-occupied receptors following phosphorylation of the receptor by GRKs. P-arrestin binding precludes further coupling between the receptor and heterotrimeric G proteins, leading to termination of signaling by G protein effectors (E). Receptor-bound P-arrestins direct GPCR sequestration by linking the receptor to components of the clathrin endocytic machinery including clathrin and P2-adaptin (AP-2). Receptor sequestration reflects the dynamin (Dyn)-depen-dent endocytosis of GPCRs via clathrin-coated pits. Once internalized, GPCRs exhibit two distinct patterns of P-arrestin interaction. "Class A" GPCRs rapidly dissociate from P-arrestin and are trafficked to an acidified endosomal compartment, wherein the ligand is dissociated and the receptor is dephosphorylated by a GPCR-specific protein phosphatase PP2-A isoform. These receptors are rapidly recycled to the plasma membrane. "Class B" receptors form stable receptor-P-arrestin complexes. 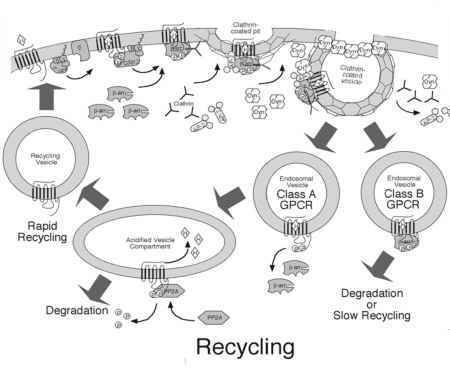 These receptors accumulate in endocytic vesicles and are either targeted for degradation or slowly recycled to the membrane via as yet poorly defined routes. recognize that the principal function of the GRK in GPCR desensitization is to increase receptor affinity for ß-arrestin. In vitro phosphorylation of the ß2-AR by GRK2 increases receptor affinity for-ß-arrestin 1 by 10- to 30fold (42). Binding of arrestin to receptor domains involved in G protein coupling, rather than GRK phosphorylation per se, leads to homologous desensitization. There are seven known GRKs. Of these, rhodopsin kinase (GRK1) and GRK7 (a candidate cone opsin kinase ) are retinal kinases involved in photoreceptor regulation, whereas GRK2 to GRK6 are more widely expressed. Membrane targeting of all the GRKs is critical to their function and is conferred by distinctive C-terminal tail domains (44). GRK1 and GRK7 possess a C-terminal CAAX motif. Light-induced translocation of GRK1 from the cytosol to the plasma membrane is facilitated by posttranslational farnesylation of this site. The ß-AR kinases (GRK2 and GRK3) have C-terminal Gßy-subunit-binding and pleckstrin-homology domains and translocate to the membrane because of interactions between these domains and free Gßy-subunits and inositol phospholipids. Palmitoylation of GRK4 and GRK6 on C-terminal cysteine residues leads to constitutive membrane localization. Targeting of GRK5 to the membrane is believed to involve the electrostatic interaction of a highly basic 46-residue C-terminal domain with membrane phospholipids. Similarly to second-messenger-dependent protein kinases, GRKs phos-phorylate GPCRs on serine and threonine residues in their third intracellular loop and C-terminal domains. The significant difference is that GRKs preferentially phosphorylate receptors that are in the agonist-occupied conformation. The subsequent recruitment of ß-arrestins only to activated receptors accounts for the specificity of homologous desensitization. Studies performed using ß-arrestin knockout mice have provided evidence of the in vivo role of ß-arrestin-mediated desensitization in modulating GPCR function. Because simultaneous knockout of both ß-arrestin 1 and 2 results in embryonic lethality, assays of the physiological function of ß-arrestins have been confined to single knockout lines. Homozygous ß-arrestin 1 knockout animals appear phenotypically normal and exhibit normal resting cardiac parameters, such as heart rate, blood pressure, and left ventricular ejection fraction. However, acute challenge with ß-adrenergic agonists provokes an exaggerated increase in heart rate and ventricular ejec tion fraction in the knockouts, suggesting that P-arrestin 1 is important for cardiac P-AR desensitization (45). Similarly, homozygous P-arrestin 2 knockout mice are phenotypically normal but exhibit a dramatic potentiation and prolongation of the analgesic effect of morphine, which is consistent with impaired q-opioid receptor desensitization in the CNS (46). In these animals, the loss of opioid receptor desensitization correlates with an inability to develop tolerance to the antinociceptive effects of morphine but does not prevent the development of opioid dependence (47).